The value of data is increasing, but so is the cost of protecting this data. Data stored online is susceptible to compromise and vulnerable to corruption threats. It can be accidental, such as a natural disaster destroying a data center, a system error corrupting a file, someone errantly erasing a folder or a RAID backing up corrupted data. Ransomware. LTO technology is the only solution that offers a true “air gap”. Having a backup completely offline protects your data from both viruses as well as ransomware threats. Encryption. LTO technology offers hardware-based data encryption (LTO-4 drives and newer), which provides powerful tape-level algorithm that doesn’t affect compression, performance and capacity. WORM. 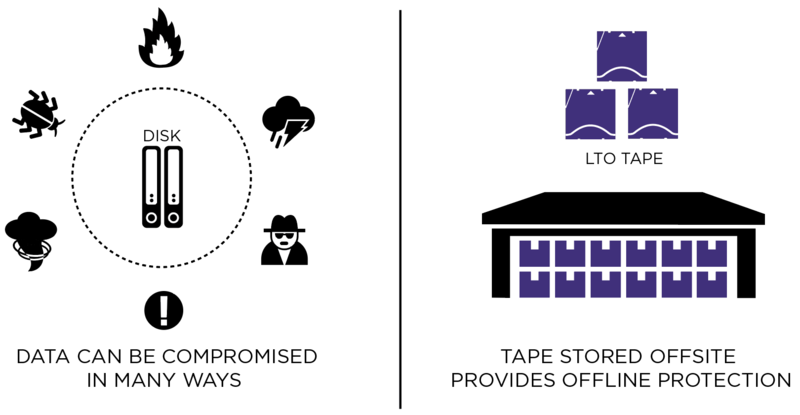 LTO technology also provides for a write-once, read many option (LTO-3 tapes and newer) that stores data in a non-rewritable format. This further protects data from being errantly overwritten and also helps to address compliance regulations. Don’t let your most important data go unprotected. LTO technology provides some of the best options available to ensure that your data is there when you need it.